I shouldn’t feel this way. I know. I am a Christian for Christ’s sake. Or at least I like to think I am. I close my eyes, open my mouth and try to express what I feel, or don’t feel. But Nada. Zilch. I should pray. I know I should, because I am a Christian. I am supposed to pray! Prayer is what we do. But I just don’t feel like it. I’m serious. I say ‘trepidation’ because I hate routine. I like doing the right thing but I hate doing it dutifully. It makes me hate myself because I feel…passionless. Then I start feeling sad for hating myself. And then guilt sets in, going on in a vicious cycle. So, yes, trepidation. Days have gone when I felt that way. It happens in relationships right? You just want to enjoy the person’s presence. But you see, it doesn’t work that way with God. Because for starters, I can’t even feel his presence, how then can I enjoy it? Secondly, I really need to pray…especially now, with all that’s going on. The silence is unbearable. I don’t say anything and neither does He and somehow this makes me mad. Why won’t you say something? Why do I have to be the one to initiate the conversation? I’ve always been one of those Christians who believe in prayer and it became really alarming when this went on for a few days. So, after a lot of pep talk, from me (and God? ), I finally decided to pray. “Our Father who art…” I say but slowly drift off. I gave it another shot and this time tried not to pay attention to how dry and frigid my voice sounded even to my own ears. It felt…forced. I mentally threw my hands up in defeat. “Lord, this isn’t working and we both know it,” I say. But what has to be done has to be done, so after several minutes of rambling and carrying on with my routine, I decided I had satisfied my conscience. Or maybe not. And this went on for days. It’s not like I don’t know I should pray. Like I said, I believe so much in prayer not just because people say so but because, I’m telling you, I have tasted its power and beauty. 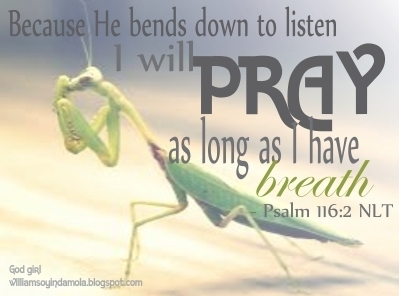 I have had times when God showed forth for me at the nick of time or even before time because of prayers. I have received strength and refreshing waters in the place of prayer. I have seen it at work. So, why can’t I just pray? It’s like every time I close my eyes to pray, my brain starts bustling with things to do yet I know every bustling outside God is just busy nothing. I tried. I promise, I really tried. But it was not a discipline issue this time. No. there was something more, keeping me from reaching that beautiful place of fellowship with God. And I didn’t know what, I just was not feeling it. I realized then that I was basing my connection with God on how I felt at that moment instead of allowing faith shape my perception of God. And a lot of this goes on in our generation. We are so in touch with the physical, basing everything on what we can see, smell, taste, hear or feel. But that is the problem because God does not dwell in the physical. We worship and communicate with God in the Spirit because He is Spirit. He is our Father in Heaven who we don’t see and want to communicate with. Our emotions have no place in this. Pay attention: Prayer is NOT about how you feel. Got it? Of course it would sometimes come to a point where God rubs on us so much that it overflows to our emotions. But, it does not begin there. Get this straight. Passion and feeling in prayer does not begin with the emotions. It begins with following God in blind-eyed faith before the manifestation of anything physical. Go and check, those who encountered God in such awesome ways in the Bible began with a step in faith. So it means that at that point you don’t feel like praying, that is the best time to pray because you pray in the Spirit and not by feeling (sight, emotion, flesh). Immediately I had this understanding, I ran straight for God. At first it seemed like a repetition of the same ol’, but I pressed for more. I pressed, bearing in my heart that I have a Father in Heaven who is just waiting for me to speak. I pressed till I was so completely immersed I didn’t even realize it. It was a wonderful feeling. But it didn’t begin with the feeling. Another tip: When you just don’t feel like praying, go to God’s word. Allow his voice soak you through His word. It spurs you to pray. Pray God’s word to him. And yes, you’ll need lots of discipline too. I'm sure by now you've noticed this is a favorite topic of mine; prayer. And in all my goodness, I have decided to spare you the pain of having to point out the obvious. So, yeah, it is a topic of particular fascination to me...the ability to communicate with the divine. And I've read a few books on this. Will probably do a book review on my top 5 books on prayer sometime.